You may thing you know nothing of Tennessee Williams' life, but if you have even a vague understanding of popular culture, you know an awful lot about Williams. It is virtually impossible to extricate the life of Tennessee Williams from his work. Any biographer will admit this fact and delve into the man to explain the work. John Lahr in his book Tennessee Williams: Mad Pilgrimage of the Flesh, did the opposite; he looked at Williams' work to explain the man. If Tennessee Williams is one of the leading dramatists of the last of 75 years, John Lahr is one of the leading drama critic and uniquely qualified to unravel the work to find the artist. In addition to the plays that are ingrained in American culture, Lahr was the first biographer to be allowed to look at diaries, letters, journals, and other ephemera. Williams made it very clear that Lyle Leverich was to be his biographer, alas his literary executor, Maria St. Just, refused to allow Leverich to quote from letters or journals. 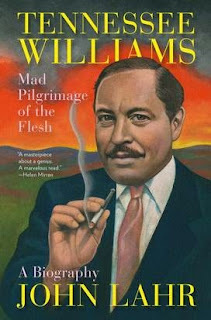 In 1995 he published Tom: The Unknown Tennessee Williams, the first volume of the two-volume biography. When Leverich died, he left his archive to John Lahr. Lahr once famously said that Maria St. Just, "was neither a lady nor a saint nor just." Upon her death, the flood gates of Williams' material became available and Lahr was privy to the information. With all this information, Lahr turned the tables looking at Williams' life within his work. The biography reads like an extended Tennessee Williams play. Lahr has seen and studied enough plays to brilliantly understand drama and he brings all the drama, trauma, and comedy of Williams life alive. In addition to a wide cast of supporting characters, the book is filled with photographs. The photos alone illustrate vast history of the American stage. While its style is a bit unusual and it is quite long, Tennessee Williams: Mad Pilgrimage of the Flesh is a worthy binge read. My copy was a Christmas gift, too.